Directions Color results guide: The shade chart on the package suggests the color results you will get with 5AB. Your color results will vary depending on your natural hair color. Dark blonde to light brown, medium brown, dark brown to black. Special Advice: More than 50% gray hair: Your results will be slightly lighter-looking than in the Color Results Guide on package. Red hair: Your color results will be medium brown with soft red tones. This shade has a cooler tone that will minimize red/orange tones. 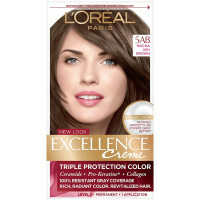 Uses Triple protection color creme. Nothing protects better, nothing covers gray better, time after time. * Before: Protective Pre-Color Serum treats fragile areas of the hair, particularly dry ends. To be used before you color. 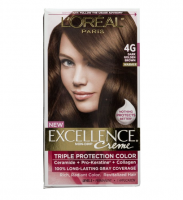 Your hair is protected, prepared to be colored evenly. 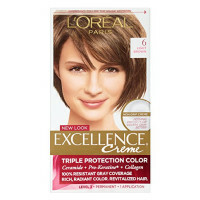 During: Excellence's extra-protective color creme gives your hair rich, radiant, even color that covers resistant grays perfectly. Nothing covers gray better. * Non-drip creme wraps every strand. After: Multi-Dose After-Color Conditioner deep-treats your hair after and in-between coloring. 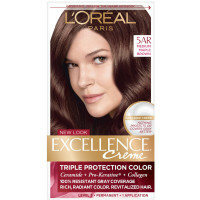 Protects your hair until the next coloring. Result: 100% perfect gray coverage. Rich, deep, perfectly even color. Even fragile hair is perfectly protected for weeks. This kit contains: protective color creme, protective creme developer, protective ceramide-protein conditioner, insert, salon gloves, exclusive Applicolor comb, protective pre-color serum. *Compared to each leading competitor's top selling brand. Warnings IMPORTANT: HAIRCOLOR CAN CAUSE AN ALLERGIC REACTION WHICH, IN CERTAIN RARE CASES, CAN BE SEVERE. 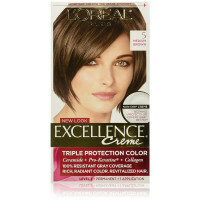 THEREFORE,YOU MUST FOLLOW THESE PRECAUTIONS: DO NOT USE IF: You have already had a reaction to a haircolor product. You have a sensitive, itchy or damaged scalp. IF YOU HAVE A TATTOO, the risks of allergic reaction may be increased. PERFORM A SKIN ALLERGY TEST 48 HOURS BEFORE EACH USE OF THIS PRODUCT (see insert). REMEMBER TO BUY YOUR PRODUCT 2 DAYS AHEAD OF TIME. Avoid contact of this product with eyes and skin. If product gets into eyes, rinse immediately. Wear gloves provided in kit. Thoroughly rinse hair after application. Do not use over compound henna or progressive color. Keep product out of the reach of children. Do not apply on children. THIS PRODUCT CONTAINS INGREDIENTS WHICH MAY CAUSE SKIN IRRITATION ON CERTAIN INDIVIDUALS AND A PRELIMINARY TEST ACCORDING TO ACCOMPANYING DIRECTIONS SHOULD FIRST BE MADE. THIS PRODUCT MUST NOT BE USED FOR DYEING THE EYELASHES OR EYEBROWS; TO DO SO MAY CAUSE BLINDNESS. READ AND FOLLOW THE INSERT. STORE BETWEEN 50 DEGREES F AND 80 DEGREES F.